Machu Picchu | Kerry On! 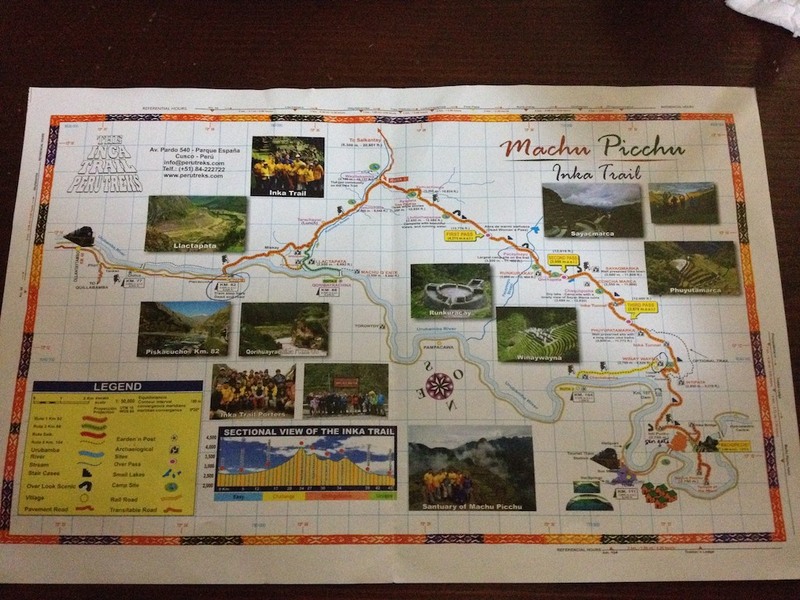 Hiking to Machu Picchu Part IV – the Payoff! We are up, packed and on our way at about 4:15 am on Day 4. It’s the big day – a short 3.1 mile hike to Machu Picchu via the Sun Gate (Intipunku). We hustle down the trail and about 15 minutes later are at the checkpoint where we have to wait until 5:30 to start the trail. Moooo. There is definitely a herd feel as we all stand around in the dark, listening to the rain and wondering why getting up so early was necessary. The trail opens at 5:30 and the groups are staggered slightly to allow some space on the trail. Soon it is our turn and, for the first time, our guides are rushing us along the path. The rain thankfully stopped while we waited at the checkpoint, and while the guides urge us to be careful, they hustle us along. It’s really weird and as we pass other tour groups, I wonder whether they have bets with other guides as to whose party arrives first at the Sun Gate. It is rather disappointing as on our last day we barely are able to enjoy the scenery as the sun is rising. We get to the Sun Gate around 6:30, after a final, vertical flight of 50 or so steps, and find it crowded with hikers and… Machu Picchu is hardly visible, shrouded by the clouds. The young guys arrived about 10 minutes before us and tell us nothing was visible then, but as we all wait, the clouds begin to lift and the sight is magical. We hang out for about 20 minutes and then hit the trail yet again. We are worn out from 2 nights with no sleep and 3 days of hiking, and the path down seems to last an eternity, even though it is only about 35 minutes before we reach the Watchman’s Hut. 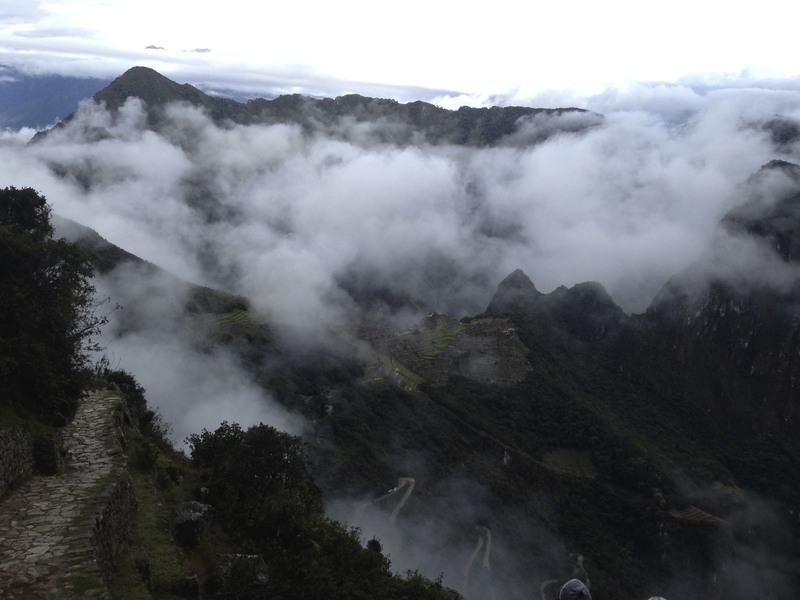 After enjoying the view, we have to descend to the entry point, drop our bags and return up to Machu Picchu for our tour. Matt and Carl enjoy a victory beverage. We climb back up to the site and Edwin starts our tour. He is losing all of us fast: not from lack of interest but because it is hot in the sun and we are exhausted. 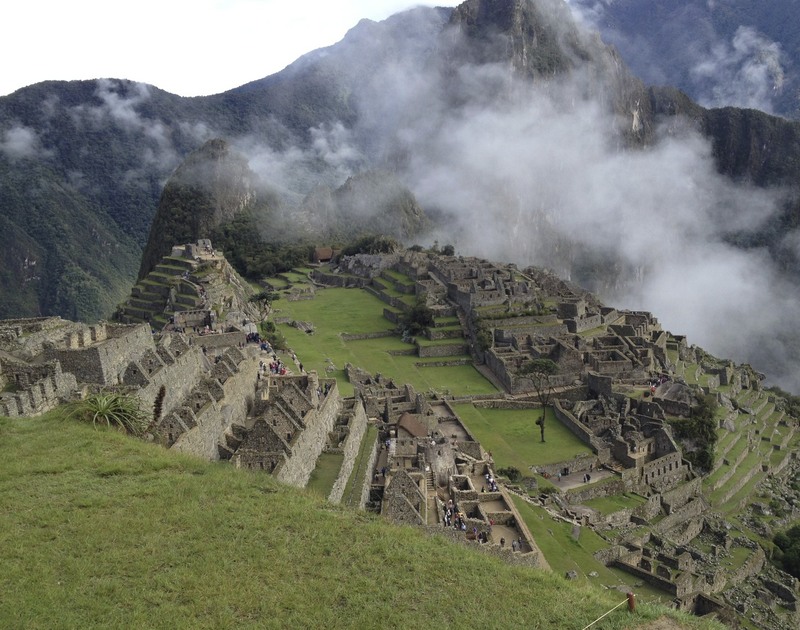 Machu Picchu is fascinating, despite the crowds. I was warned that after hiking the trail, the hordes of tourists will feel overwhelming – and cause great irritation because they are clean and rested – and this prediction is correct! After a few hours enjoying Machu Picchu, we head down to Aguas Calientes where we pick up our gear and relax for a few hours. The town exists to cater to Machu Picchu tourists and hotel, restaurants, massage spas, hot showers and markets abound. Our train for Cusco leaves at 5:30 and we appreciate the nice service and clean, comfortable seats. The train has entertainment: first, a dancing shaman and then, a fashion show put on by the wait staff. It’s rather awkward and all the more when the Shaman picks me to dance with him. Now I am smelly, in hiking boots and exhausted, but I do my best even though the scary Shaman is like a clown and I hate clowns! The trek was fantastic and I would actually consider another hike somewhere. I also want to return to Machu Picchu to appreciate the site when I am not completely exhausted. Machu Picchu is the most famous Incan site and the mainstay of Peruvian tourism. Built around 1450, it was abandoned in the mid-1500s and was never discovered by the conquering Spanish. Theories abound as to the purpose of Machu Picchu, with the current, most popular one being that the Inca emperor Pachacutec wanted to build his own magnificent capital city instead of ruling from Cusco, the traditional capital of the Incas. Machu Picchu is situated in the Sacred Valley 50 miles (80 kilometers) northwest of Cusco. As one of the 7 New Wonders of the World, it was on our must-see list. Our initial decision was how to get there. The most accessible way to see Machu Picchu is to take a train from Cusco to Aguas Calientes and then take the 20 minute ride on the tourist bus to the site. Once there, it is easy to spend a day wandering around the city. The more adventuresome can climb Hauyna Picchu, 1,180 feet above Machu Picchu and a one-hour climb, to get a spectacular view of the entire site and see additional ruins, ascend Machu Picchu Mountain or hike up to the sun gate. 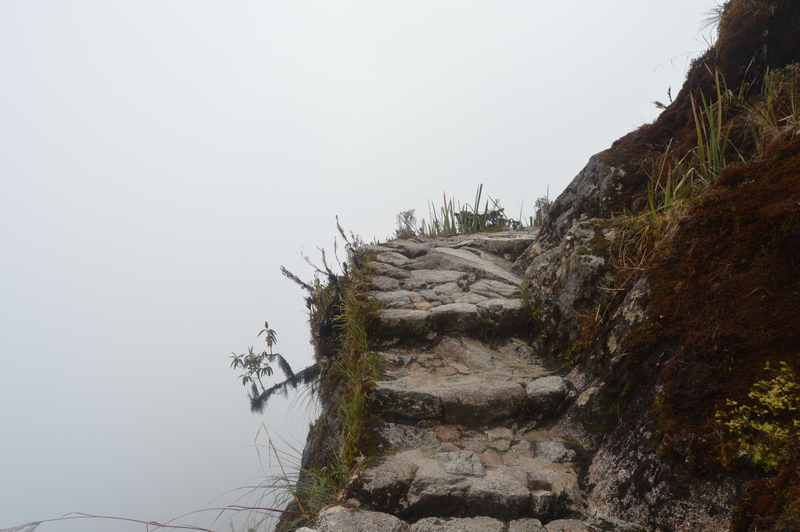 So even if one takes the “easy” way to Machu Picchu, there is still plenty of hiking to do on the site itself. 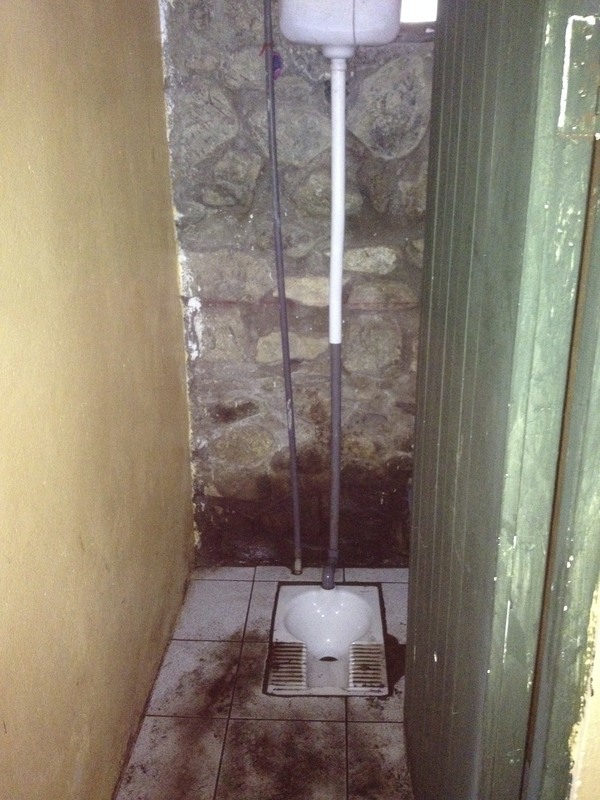 But Matt was having none of “easy” and was set on hiking the Inca Trail. 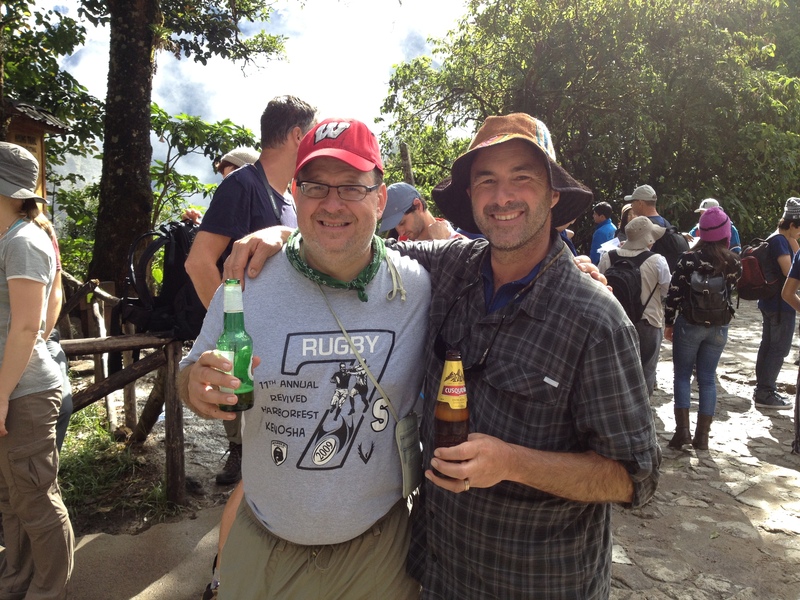 Once our friend Carl and his brother Mark decided to join Matt on the trek, I couldn’t wimp out. 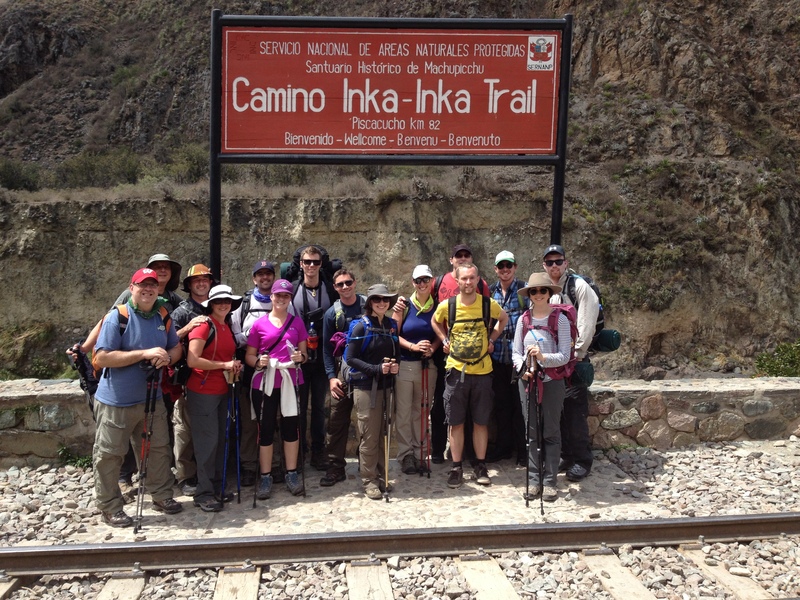 We chose the most popular 4-day, 3-night hike and after reviewing Trip Advisor and the like selected Peru Treks as our trek company. 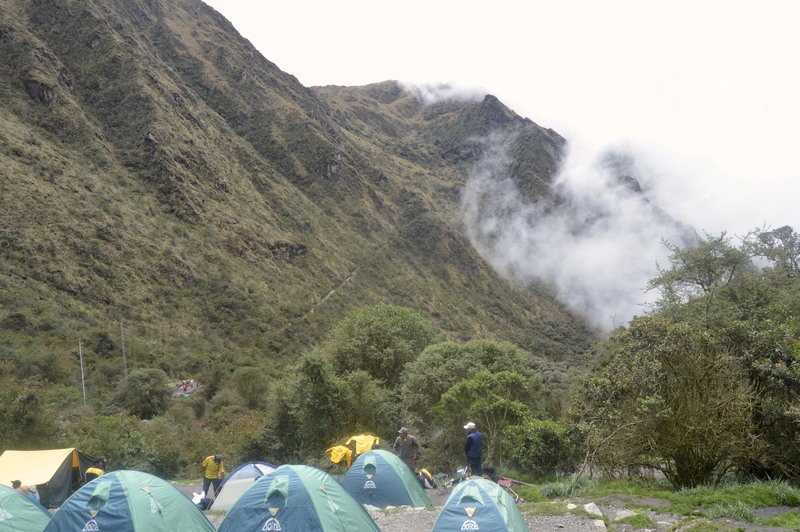 For $599 a person, Peru Treks outfitted us with tents, sleeping bags and mats, purchased our permits, secured our campsites and provided us with meals and guides for the trek, in addition to a crew of porters who carried all of the gear. Our cost included $60 for the service of a personal porter who in addition to carrying our sleeping mat and bag could carry another 5.5 pounds of personal items for us. 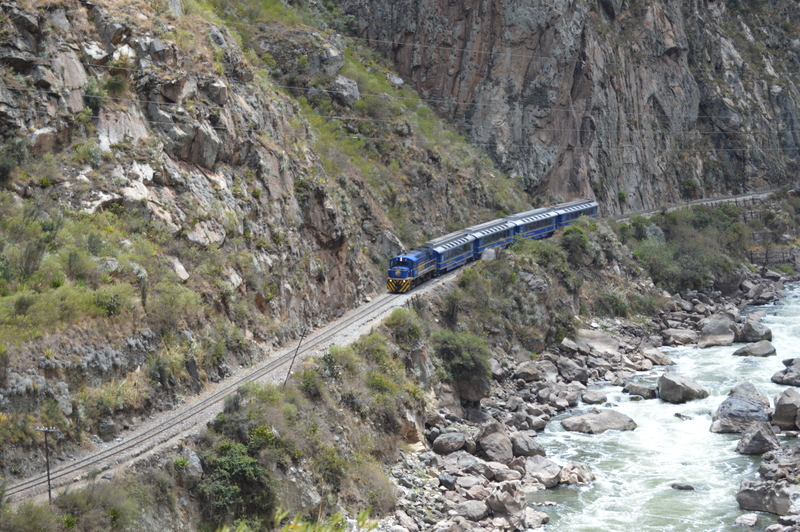 Peru Treks sends you back to Cusco via an 1 1/2 hour train ride followed by a 2 hour bus ride. This sounded horrible to me so we opted to book the Peru Rail Vistadome train ourselves and take a 3 1/2 hour train ride and 20 minute cab ride instead. It was the right call as the train was far more comfortable than the bus, and the cost difference was only $45. 4 days later, we would be on that train! 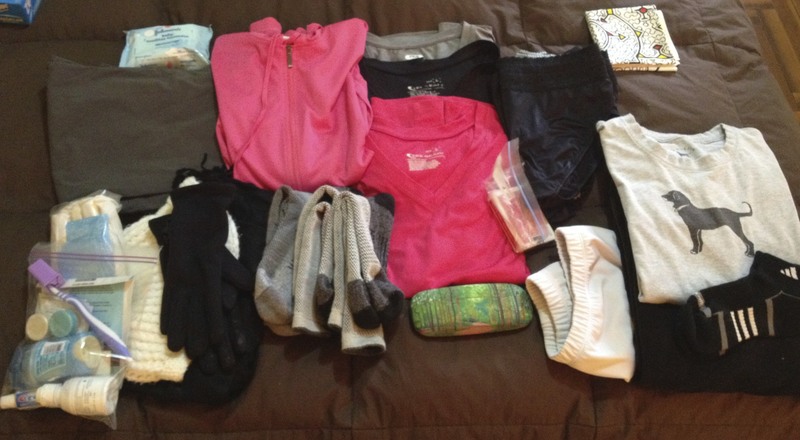 With the planning details out of the way, training and packing became my next concerns. Everything I read indicated that while the hiking is difficult, the hardest part for most people is the altitude. We were taking the orange route, which begins at Kilometer 82. Day 1: 7.5 miles (12 km), begin at 8,528 feet (2,600 m) and ascend to 10,137 feet (3,100) for a 1,609-foot (500 m) elevation gain. Touted as the “easy” day of the hike, it wasn’t exactly easy, but not terribly difficult compared to the next two days. Day 2: 7.5 miles (12 km), begin at 10,137 (3,100 m) and ascend to 13,776 feet (4,215 m) for an elevation gain of 3,639 feet (1,115 m) before a steep descent back to 11,480 feet (3,500 m). This second day is the reputed killer day of the hike. When I was in Lima 2 weeks before the hike, I ran into some folks who had recently completed the hike and they told me horror stories of hiking 11 hours and tears all around. I am happy to report that our group hiked it about 6-7 hours (including snack and lunch breaks) and there were no tears that I am aware of. Day 3: 9.3 miles (15 km), begin at 11,480 feet (3,500 m), hike up to 12,916 feet (3,950 m) for an elevation gain of 1,436 feet (450 m) before the descent of 3,000 stone steps that is referred to as the “gringo killer” and then additional up and down hiking until the end at 8,829 feet (2,700 m). I found this day to be the hardest. Possibly because I was tired from lack of sleep the prior night and the hard hiking the prior day, but just as likely the fact that when we camped the second night we had a view of the climb that we would immediately begin on Day 3. I think seeing the ascent (and the top of the photo is not the top of the pass, there were about 3 more false passes before one arrived at the pass) demoralized me. But no tears or 11 hour days! Day 4: The end is in sight! 3.1 miles (5 km), this is where the trail really feels like a cattle call. We were up around 3:00 in order to break camp early and then rush 15 minutes to stand in line at 4:30 am waiting for the trail to open at 5:30. Once open, it was a mad dash to the sun gate to see the view of Machu Picchu, and then a trek down the mountain to the site. Matt and I live at around 8,800 feet above sea level, so that gave us a good start on training for the hike. I continued with my walks 4-days a week and Matt with his daily walks to work, and then Matt and I would hike on the weekends. Usually Matt kindly carries my water and jacket for me as I despise carrying a backpack (and it is one of the things that I was advised against doing after my spinal fusion surgery so I routinely invoke the prohibition when I don’t want to carry anything but then chose to think that it refers to heavy backpacks and not a few pounds when I wanted to do this hike), but I even started carrying my own pack to get me accustomed to it. 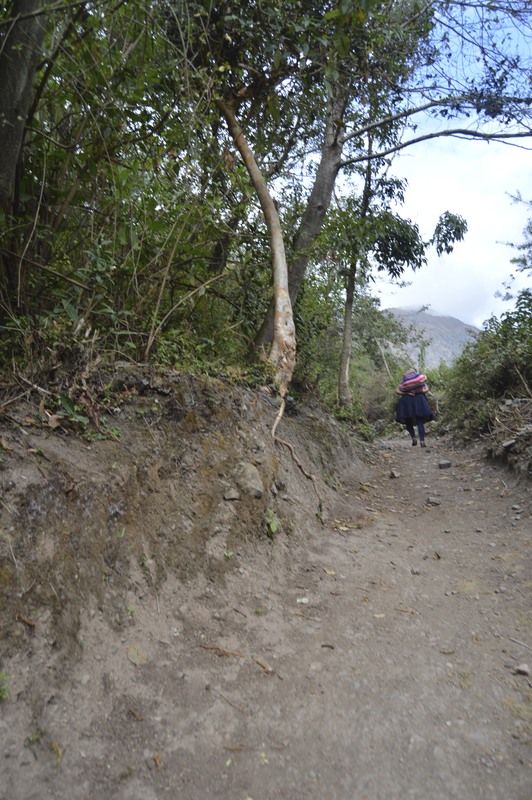 Our last joint training hike was our second trek to Cumbe Mayo, which is also on the Inca trail, is about 7 1/2 miles and is fairly steep with a 3,000 foot elevation gain, so I was feeling as prepared as possible for the hiking part of the trek. Girls going to Grandpa’s house (I asked). WATER. And water is HEAVY!! 2 liters weighs 4.4 pounds. It always felt so good when I was hiking with only a half liter or so of water left. So when all was said and done, I carried about 10 pounds. In the end, I packed darn good – with the exception of one pair of underwear, the flashlight and the notepad/pen, I used everything I brought. Matt only had an extra pair of socks and underwear, so he packed well too. Oh, and these stowaways made it into my pack too! Next Up: The Trek Begins!